The incubator is a valuable facility in the hatching process. But the success and benefits brought about by this hatching machine do not come on a silver platter. On the contrary, they are a result of concerted and consistent efforts by the farmer. These efforts are exerted to ensure that all the necessary conditions that the incubator needs to deliver hatching success are met. Some of the most important variables in the hatching process are proper humidity and adequate ventilation. These twin conditions are very important in determining and facilitating the success of a hatching process and if they are not set and maintained correctly, the entire hatching process will be a flop and waste of money and time. A great many modern incubators that we have come with small containers that hold water that needs to be topped up after every 2 or 3 days so that the humidity in the incubator is maintained. Moreover, proper ventilation is vital in the incubating success because it permeates into the porous shells of the eggs in order to allow them to breathe. Moreover, a great many of modern incubators regulate their humidity by either facilitating the decrease of the increase of the ventilation thus decreasing or increasing the level of air change in the incubator. But the music is sweeter to a few farmers who have laid hold on smart incubators. These incubators control humidity and ventilation automatically through an in-built system comprising a pump and a humidity measurement system that is regulated by a microprocessor. However, if you do not have a smart incubator, then this article is for you because it is going to furnish you with the relevant information you need to regulate these vital hatching variables. This is because the relative humidity of the air around the incubator is subject to steep variations as the incubation weeks keep moving forward towards hatching. That is why it is vital to keep monitoring it as per the tips provided in the following sections of this article. This is the first step you need to take before you deal with the humidity. 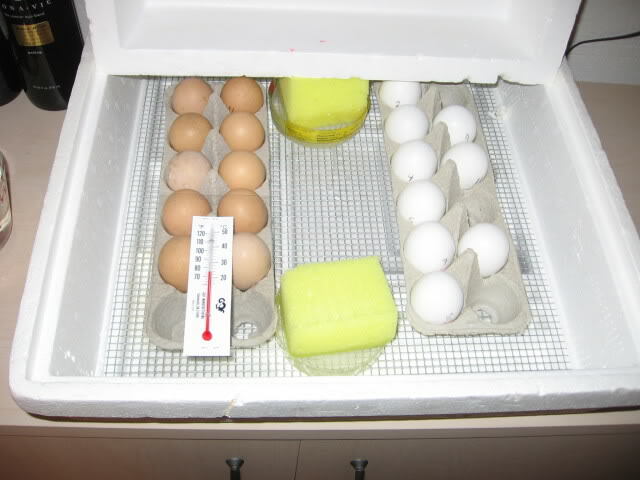 You need to check and establish the temperature of the incubator first. If you are using a method such as wet bulb thermometer, make sure that the temperature of the two thermometers is the same before you begin the checking process. The second tip on the list is raising the level of humidity using an atomizer. As the eggs are undergoing incubation, use an atomizer to spray small quantities of heated water into the ventilation pores of the eggs. This will ensure that the humidity in the incubator is raised. This tip is important in cases where you are incubating goose or duck eggs although this may still apply to other eggs. 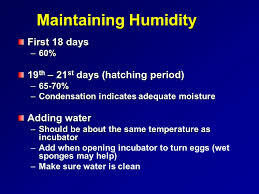 Another area you need to pay attention to is the temperature of the water that you are adding in the incubator. Always make sure that the temperature of that water is the same with the one in the incubator. This will ensure that neither the eggs nor the incubator are stressed by the contrast in water temperature. Make sure that the water you add in is just warm enough to touch without scalding your skin. Now that you know these steps, you can implement them and rest assured of successful hatching results that you will be proud of.